Leah Hogsten | The Salt Lake Tribune Mountaineer Audrey Smith guides veteran Nico Maroulis on her descent from the summit of the Grand Teton. Maroulis had a week and a half to prepare for this trip after agreeing to the trip. She keeps in shape by Olympic weight lifting, but has little climbing experience. 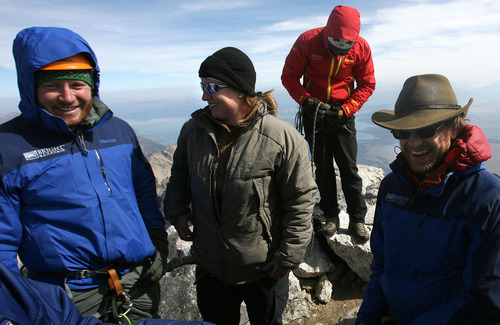 Leah Hogsten | The Salt Lake Tribune Veterans Andrew Sullens, Nico Maroulis and Chad Jukes share a light moment on the summit of the Grand Teton. 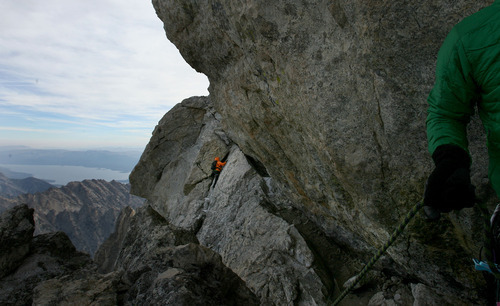 Chad Jukes summed up the challenges the team faced; "I just feel like climbing is as amazing as therapy. When you're in the mountains you tend to forget about a lot of things. It really puts things in perspective." Leah Hogsten | The Salt Lake Tribune Veteran Chad Jukes said he's never regretted amputating his right leg, although the biggest challenge for him is that he has no sensation in the prosthetic and cannot feel the rock underneath his foot. In the times when he's feeling sorry for himself, cursing the whole situation, the pain, saying "'Oh poor me, I'm missing my leg,' he stops and says, "Chad, shut up. Stop your whining.' And I get right back to living, which is a lot better than the alternative." Leah Hogsten | The Salt Lake Tribune "There were so many things against us, so many that could have shut us down, but in the end, absolutely everything ended up working out in our favor," said Chad Jukes, (right) hugging fellow veterans Andrew Sullens and Nico Maroulis on the summit of the Grand Teton. 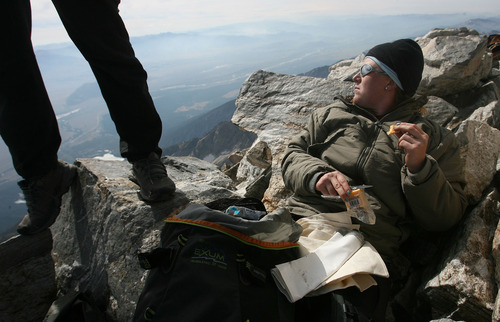 Leah Hogsten | The Salt Lake Tribune Nico Maroulis relaxes at the summit of the Grand Teton with fellow veterans and guides. "Sept. 11 is such a heavy day for me and it's hard to put into words exactly why that is," said Maroulis. She admitted the date has always been "filled with all this emotion and heavy feelings that I didn't really have a place to put, but this trip was a way to "take it back." "It kind of allowed us to take it back, to say 'You know what? It's going to be my day again." Leah Hogsten | The Salt Lake Tribune The battery on a vacuum pack that keeps Andrew Sullens' silicon sleeve tightly sealed around his leg in its prosthetic socket failed on the ascent, causing a painful, jarring effect. The pain coupled with high altitude sickness on the climb, made him nauseous, and he thought of quitting several times. "What kept me going was … there is a bigger picture here and that's what we're trying to prove." Leah Hogsten | The Salt Lake Tribune Morning comes early at the Exum hut -- 4:40 a.m. -- for the three disabled veterans, three guides and seven others who accompany them. 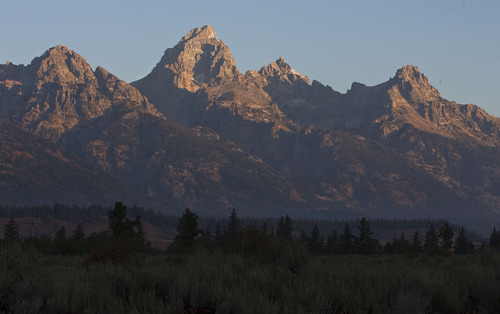 The wind at the Middle Saddle of the Grand Teton is at 42 miles per hour, with gusts of 64 mph that nearly knocked the climbers off their feet. 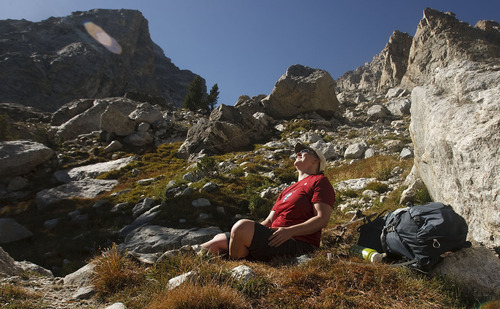 Leah Hogsten | The Salt Lake Tribune veteran Nico Maroulis catches her breath atop the Grand Teton. "I lost a lot of friends in this war, and how do I honor their lives?" questions Maroulis. "Me sitting at home is not going to honor the sacrifices they made. We need to get out of our own little bubbles and truly, truly live because they can't any more. Leah Hogsten | The Salt Lake Tribune Mike Abbey, 36, a former Force Reconnaissance Marine and mountain warfare specialist who served several tours in Iraq, reassures Nico Maroulis during the ascent of Grand Teton. "Though climbing requires you be part of a team, it's your responsibility and hard work and effort that gets you to the top," said Maroulis. "That's so important to self-worth and self-value." 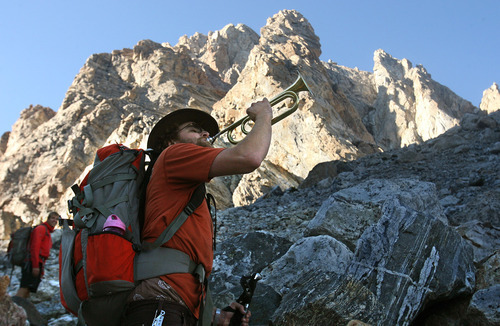 Leah Hogsten | The Salt Lake Tribune Chad Jukes draws a laugh from fellow climbers as he warms up his bugle on the 7-mile, 5,000-foot hike to the Lower Saddle of the Grand Teton that he planned to play at the summit. Jukes, lost his right leg below the knee as a result of injuries he sustained in an IED attack in Iraq. When he was deciding whether to amputate, another climber told him he'd rather be an amputee than a cripple. "That phrase became my battle cry, my banner," said Jukes. "It changed my total outlook." Leah Hogsten | The Salt Lake Tribune The September 11, 2012 ascent is grueling and technical, led by veteran Exum Guides to the 13,770-foot Grand Teton peak. Sponsor Paradox Sports' Timmy O'Neill believes veterans who sign on for climbs such as the one in the Tetons have a chance to grow. "Such climbs are painful and arduous," O'Neill said, "and prepare us for all those times. Life is like that." Leah Hogsten | The Salt Lake Tribune Climbing is good for injured vets, who have faced many challenges, stayed active and had goals, standards and tests they have had to reach said Eric Gray (left) climbing the Grand Teton with good friend and veteran Andrew Sullens (right). Gray quit his job to start a non-profit, Catalyst, to help those with disabilities learn to rock climb. Gray says climbing, "really gives them something to train for and keep their minds on." 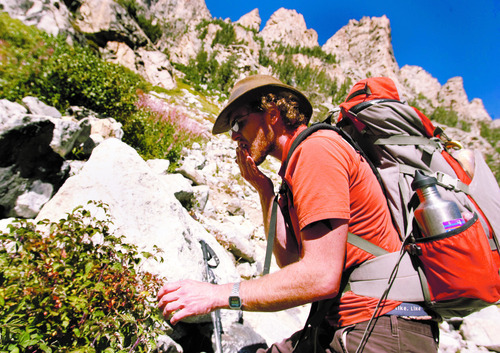 Leah Hogsten | The Salt Lake Tribune Veteran Chad Jukes, 28, who grew up in North Logan, eats wild raspberries from bushes along the route to the middle saddle of the Grand Teton. Jukes, ever jovial and chatty along the hike jokes about his prosthetic leg, "people really like coming into bear country with me; they know they can outrun me." Leah Hogsten | The Salt Lake Tribune As part of the healing process and to commemorate the day that changed America and their lives forever, a group of disabled veterans are participated in the Bright MountainParadox Sports 9-11 Veterans Climb in Grand Teton National Park. 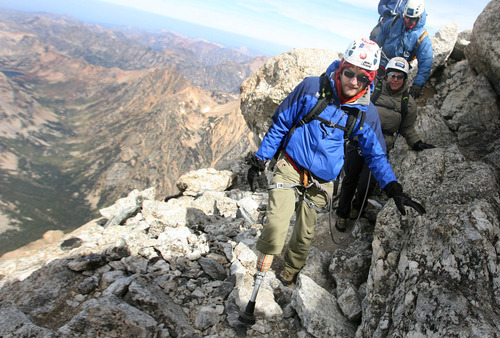 Three disabled veterans led by veteran Exum Guides summited the park's 13,770-foot Grand peak, September 11, 2012. 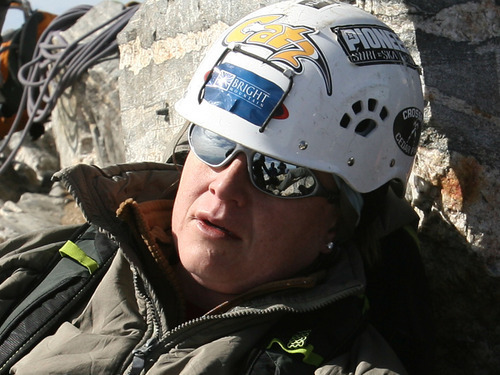 Leah Hogsten | The Salt Lake Tribune As part of the healing process and to commemorate the day that changed America and their lives forever, a group of disabled veterans are participated in the Bright MountainParadox Sports 9-11 Veterans Climb in Grand Teton National Park. 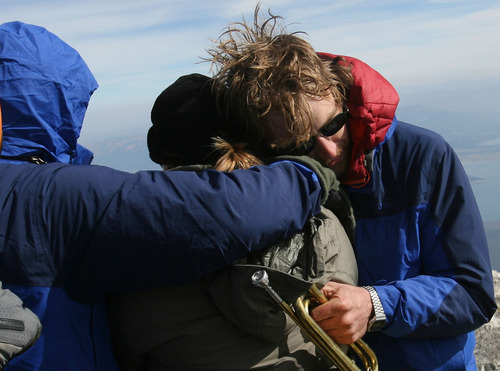 Three disabled veterans led by veteran Exum Guides summited the park's 13,770-foot Grand peak, September 11, 2012. Grand Teton National Park • The nylon walls of the hut perched on the moraine between the Middle and Grand Tetons slap in the wind as weary climbers pass chunks of chocolate and joke away their worries in the gathering darkness. Chad Jukes, 28, who grew up in North Logan, recounts the absurdity of putting his prosthetic leg on and taking it off for poses in yoga class. There's talk of inventing weapons like those in the movie "The Girl with the Dragon Tattoo"  knives jutting from prosthetic limbs. "You ought to get a Sharpie and paint a moose on that leg of yours," Jukes tells Andrew "Sully" Sullens, an Afghanistan war veteran from Georgia who is rolling a compression sleeve up his right leg, which ends just below his knee. A pensive Sullens, 29, takes care with the sleeve. If his stump is swollen, it won't fit into his prosthetic leg's socket in the morning when he, Jukes and Nicolette "Nico" Maroulis, 35  three veterans injured in war  begin the final ascent to the summit of one of the West's classic mountains, Wyoming's Grand Teton, 13,770 feet above sea level. 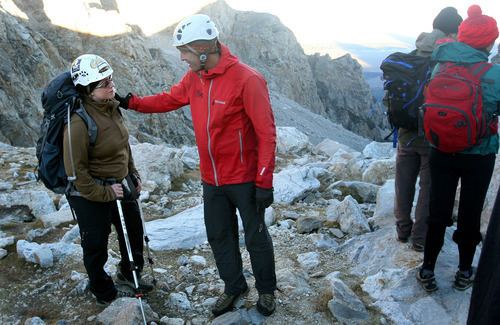 Two of their Exum Mountain Guides are veterans of the Iraq and Afghanistan wars. 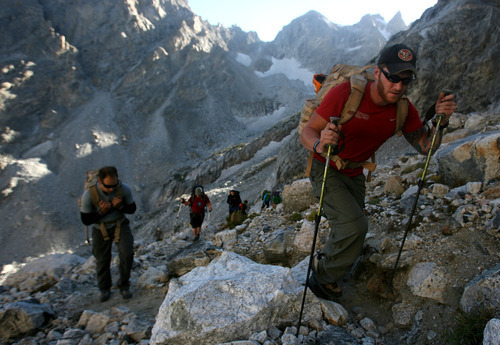 The group has hiked seven miles and 5,000 feet of elevation to reach the lower saddle of the Grand Teton on the eve of Sept. 11. Heading up. • Waking at 4:40 a.m. the next morning, Sullens, of Dahlonega, Ga., and Maroulis, of Austin, Texas, are feeling the effects of the hut's 11,600 feet elevation. Sullens is queasy and has to force himself to eat oatmeal and beef jerky. Maroulis is slightly dizzy and her hip hurts. Both have headaches. But Jukes, who lives in the high-altitude town of Ridgway, Colo., is acclimated. He spends nearly an hour pressing mugs of Vick's Blend coffee from Boulder through an AeroPress. The three disabled veterans are accompanied by three guides and seven others, including Timmy O'Neill, a well-known climber and executive director of Paradox Sports, a Boulder, Colo., nonprofit, which is a sponsor of the trip, along with the charitable website MyBrightMountain.com. One Exum Guide is Mike Abbey, 36, a former Force Reconnaisance Marine and mountain-warfare specialist who served several tours in Iraq, including two years as a State Department contractor. He jokes that Jukes may as well pump all the caffeine he brought into his fellow climbers. The climb "will be quicker in the long run, even if it takes us a half hour to drink it," says Abbey, who will use ropes hooked to Jukes' and Maroulis' harnesses to keep them safe on the Grand. When the team sets out for the summit at 6:35 a.m., the temperature is 36 degrees but wind chill makes it feel like 21. The wind is blowing at 42 mph, with gusts of 64 mph that nearly knock the climbers off their feet. "That was the biggest gut check," Sullens says later. "I was hauling up that hill with my head hung low, thinking, 'What the hell am I doing?'" Sullens: 'This is bigger than myself' • Four hours and 15 minutes of pulling and pushing his muscled body up granite pitches and Sullens is on top, looking at a view that reaches as far as Old Faithful in Yellowstone to the north, Jackson Lake below, the smoke-choked town of Jackson to the south and Idaho's Teton Valley to the west. The battery on a vacuum pack that keeps his leg's silicon sleeve tightly sealed in the socket has failed on the way up. The bottom of his leg hurts. "I'm pretty beat," says Sullens. "I just want to nap." The former sheriff's SWAT team member says he wanted to quit several times on the ascent but knew he couldn't. "This is bigger than myself," says Sullens, who joined the Navy a year after the Sept. 11, 2001, terrorist attacks because he couldn't see sitting on the sidelines as his generation fought the war. He was in the Georgia National Guard when an improvised explosive device (IED) exploded his truck in Afghanistan in 2009. After trying to make do with a mangled leg, he opted for amputation in February 2011. Sullens says he summited Grand Teton as an example to other injured vets who might be tempted by self-pity. "Sure you were injured, but you don't have to feel something was taken away from you," says Sullens. "You've got to be willing to get up that extra 20 minutes early to put your leg on. You can be that person." Jukes: Climbing past amputation • Atop the Grand, the team poses for pictures with sponsor banners. Once settled, they observe a somber minute of silence before Jukes pulls out his bugle. Its brass mouthpiece is brittle in the cold, but he manages a clear rendition of taps. Afterward, the three injured vets, all now in college, hug for a long while. Maroulis turns her back to hide tears. Jukes, 28, joined a Logan-based Army Reserve unit in 2002 while still a senior at Skyview High School in Smithfield and had hoped to make it into the Army Band. Instead, he was sent to Afghanistan and later Iraq, where his right foot was smashed in a December 2006 IED attack. Four months later, while on convalescent leave in Utah, his foot became infected and he made the decision to amputate. Jukes uses a foot called a "stomper," which looks like a hockey puck on a pylon. It leaves a smiley face impression in dirt. He has never regretted leaving his foot in the surgery suite at Ogden's McKay-Dee Medical Center. "I basically chopped it off so I could climb." Maroulis: 'My summit day' • Maroulis says Sept. 11 anniversaries are always difficult. "A lot of soldiers celebrate their 'alive day,' the day someone intentionally tried to kill them," says Maroulis, who was working at a U.S. government school in Germany in 2001 and joined the Navy just days after the attacks on the World Trade Center and Pentagon. A bomb-sniffing-dog handler, she was injured in a 2003 blast and suffered a traumatic brain injury that put her in a wheelchair for about three years. She continues to have equilibrium issues and has had five surgeries in the past year. Conquering the Grand on Sept. 11 is an attempt to regain control over tangled emotions, she says. "It's … a way for me to put all that emotion I've been feeling about that day and leave it on the mountain, take it out on the mountain." "This," says Maroulis, "is my summit day." Heading down • Guide Mike Kirby, 35, is moved by his charges' achievement. "I love you guys, everyone," he says. Kirby, the veteran with the most recent injury, guides Sullens and Eric Gray, who is Sullens' friend and climbing instructor from Atlanta. A Ranger who taught other soldiers mountaineering skills, Kirby was in the Army twice, in the 1990s and again for most of the last decade. He did three tours in Iraq and one in Afghanistan, getting out in the summer of 2011. In October, he suffered frostbite while climbing Long's Peak in Colorado and had half of his right foot amputated in December. He uses a temporary prosthetic. This Sept. 11 trip was his idea, and now, at the top of the Grand, he's keeping it moving. "Well, guess what?" he says, as Jukes puts his bugle away. "We've got more work to do. We've got a long way to go." 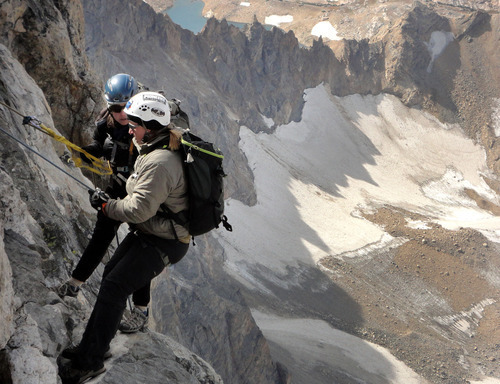 The team climbs down the Owen-Spaulding route on the west face in about 3½ hours, including a rappel down a particularly steep pitch. Sullens' leg is too thrashed to continue the steep hike out, so he, Gray and Kirby stay for a second night in the lower saddle hut before hiking out Sept. 12. 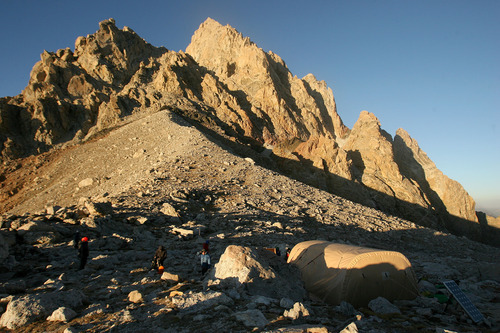 The rest eat a late lunch, move their clothes, food and water into bigger backpacks and begin walking in the late afternoon past the Middle Teton glacier and into Garnet Canyon. It is dark an hour before they reach the Lupine Meadows trailhead. Maroulis, who has poor depth perception in the dim light of her headlamp and has been struggling to take each step because her knees keep locking, says this is one of the toughest parts of the trip. But she never considers quitting. "It makes me feel good to have that idea in my head that, no matter what I'm faced with, I can find my way out." Getting out, getting well. 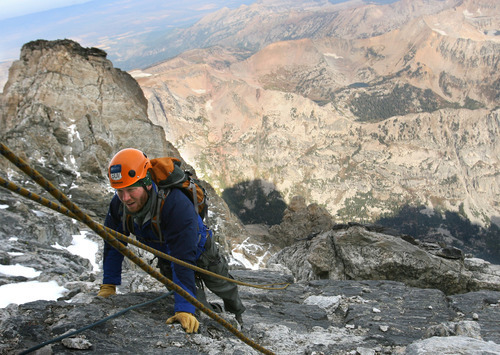 • Gray, who helped start the Veterans Affairs' first adaptive climbing program at the VA hospital in Augusta, Ga., says climbing and other recreational therapies often works wonders in ways that psychotherapy can't. When vets climb together, it creates a potent medicine made of goals set and reached, teamwork, communication and camaraderie, he says. "Climbing is a group thing. It's like the brotherhood you have in the military. You have to trust in the person holding onto the other end of the rope," he says. It can also give an adrenaline rush that vets miss, he says. And often, at the end of a day of climbing, as veterans sort through the experience, they open up in ways they don't do for therapists in offices. "They naturally tell their story when they are ready," says Gray, who has quit his job at the Augusta VA to start a nonprofit, Catalyst Sports, to help those with disabilities learn to rock climb. Jukes and Maroulis have both witnessed the benefits. They first met on a cross-country veterans ride in 2010  he on a bicycle and her on a hand-cycle and later that year climbed the 20,000-foot high Mount Lobuche in Nepal as part of a veterans group. "I've seen a lot of people who are disabled. I've seen their lives completely changed," says Jukes. "People who feel incomplete go out in the mountains and go through a complete transformation that years of traditional therapy didn't achieve." Keith Tidball, a Cornell University researcher who served in the National Guard for more than 15 years, says the VA and Department of Defense increasingly recognize the value of getting injured vets into nature for fishing, hunting or more extreme sports. But there isn't yet much empirical data for why it's good medicine and that means there's not a lot of money for such programs. "It should be a given and it should make sense, but it doesn't quite yet," says Tidball, who has two research projects involving veterans in nature, funded by the Department of Agriculture and the Environmental Protection Agency. "These soldiers are just coming back in waves now, so I am just at the very tip of the iceberg," he says. Maroulis says such physical challenges continue to help her heal. "After you get injured, so many people are worried to let you do anything. They don't want to see you fail," she says. But conquering a goal "expands my identity and allows me to see myself as more whole than I could before. I'm not just the injured girl anymore."